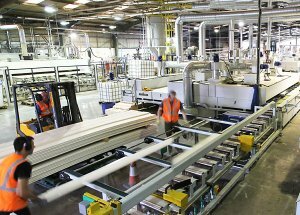 Leading supplier of MDF profiles, The W.Howard Group, has made a substantial investment into its Kildare site, with the introduction of a MAKOR production line. The replacement of a single pass line introduces significant commercial flexibility to its operation in Ireland with a potential increase of around 80% available to the group capacity. As the first investment at the site since 2012 and since the Group acquired the operation in 2016, Kildare forms a key part of its business strategy for 2018 and beyond. The W.Howard Group manufactures skirtings, architraves, window boards, door linings and bespoke products and supplies quality products to builders merchants, specialist trade manufacturers and the public. It produces one of the largest ranges available in Europe including primed, veneered, foil wrapped and fully finished profiles as well as its exclusive KOTA™ finish. The Kildare plant specialises in primed product whilst KOTA™ offers a unique product with significant opportunity for growth. Speaking about the investment and renovation of existing equipment for this project, W.Howard's managing director Graham Williams said: "This investment demonstrates our commitment to the development of the business and the expansion of our range for the market. Strategically, the Kildare operation allows us to explore opportunities in both ROI and NI, as well as providing a genuine platform for European trading which is ever more important given the fluidity surrounding Brexit negotiations."